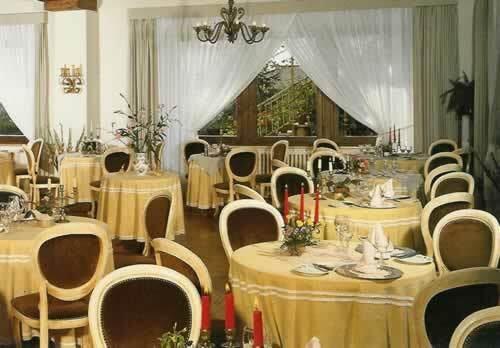 If you fancy dinner in an English country house hotel outside Siena, I know just the place. No, let me correct that. I should have said a Scottish country house hotel, for the influence is definitely from what we were once allowed to call ‘North Britain’. And that influence is Bruce Stoddart, Manager of the Villa Scacciapensieri. It was dark when my taxi turned through the gates and trundled up the long drive towards this early 19th century mansion. But even in the gloom, I had a sense of the extensive and impressive grounds. From their terraces, I am told, are fine views of the city walls of Siena and of the rolling hills of Chianti. Inside the house, there was a lovely feeling of warmth and cosiness. There are some fine oil paintings on the walls and, best of all when one has just come in from a chilly night, a vigorous open fire was blazing in the sitting room. You see what I mean about the country house hotel? In the long, L-shaped dining room, were yellow tablecloths, brass chandeliers and waitresses in damson-coloured waistcoats. On my table were a bowl of white roses and a single candle. The maitre d’, Andrea Vitti, wore black tie. He was friendly and went to considerable trouble throughout the evening to ensure that I was having a pleasant time. Which, indeed, I was – for I like old-fashioned courtesy in a comfortable setting. Like the menu, the wine list is marked by its brevity and its patriotism. It begins with a white Orvietto at 12 euros and runs up to one of the great ‘super-Tuscans’, Solaia, at 115 euros. The latter is available in both the 1998 and 2000 vintages. All the wines here are good value, but this is a real bargain. My own drinking brought two contrasting bottles. My white was a medium-bodied, slightly toasty chardonnay (Castello della Sala, 2003 – 21 euros) – a shy, modest girl of a wine. My red was a young fellow with bulging muscles, full of eagerness. Even after decanting, its tannins burst out; yet its dense cassis, aroma of new-mown grass and extraordinarily long aftertaste made me smile with pleasure (Fattoria del Cerro Riserva, 1999 – 32 euros). 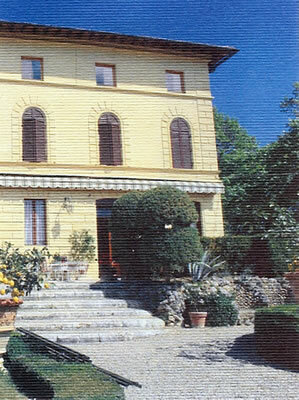 I enjoyed my evening at the Villa Scacciapensieri. I think you will, too. Via di Scacciapensieri 10, 53100 Siena, Italy.